Mark Francis is best known for his paintings of microbiology – from depictions of magnified cells to glossy images of spores, sperms and DNA. Through amplified scale and deliberate scientific inaccuracy, these earlier works toyed with abstraction and gradually made way for an increasingly expressive painting style. Since the 1990s, when he first came to prominence, Francis’ practice has become visibly bolder and more formally complex. As seen in Arena, the artist’s first major British solo show in almost ten years, his recent output of large-scale canvases, prints and mixed media works represent a new and exciting stage of development. Revealing over 50 wall-based pieces, including several new commissions, Abbot Hall Art Gallery in Cumbria presents a stunning selection of the artist’s work made between 2006 and 2010. A grid-like motif, first introduced as early as 1993, finds prominence here, adding conceptual value to an otherwise abstract aesthetic. Though initially used as a compositional device, Francis’ grid explicitly alludes to cartographic formations, sounds graphs and astronomical diagrams. Always acknowledging his interest in physical forces – the natural or man-made trajectories of particles, matter, data or light – Francis positions himself, and the viewer, amidst myriad ‘mapscapes’[i] of invisible spaces. Referencing industrial networks, transport technologies and internet pathways, these vibrant paintings are expressive and visually urgent. Works such as Two Stops Over create an ‘arena’ where movement is temporarily stopped, considered and visually dissected. Here a flattened, pictorial plane, latticed by confident strips of cadmium red, imagines a world where the lines, pathways and contours of invisible journeys are visibly rendered. Deliberate blips and splashes of paint scatter these structures, adding a visceral sense of artistic involvement. In turn, the artist’s perceptible presence, evinced by these marks, disrupts an otherwise linear image – as if Mondrian, Newman and Pollock have somehow serendipitously collaborated. In other works, intangible internet topologies find physical form in paintings such as Quanta. 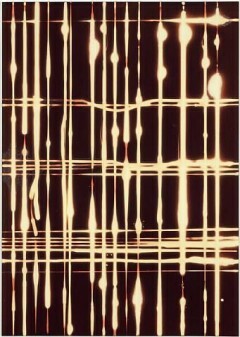 Or, as seen in the series Grid (2009), Francis visually translates the transmittance of light through man-made cables, wires and computer-based networks. An image showing the Hermann grid illusion. Whilst his paintings are large and compositionally flat, these smaller scale mixed media pieces have a lyrical, liquescent quality. 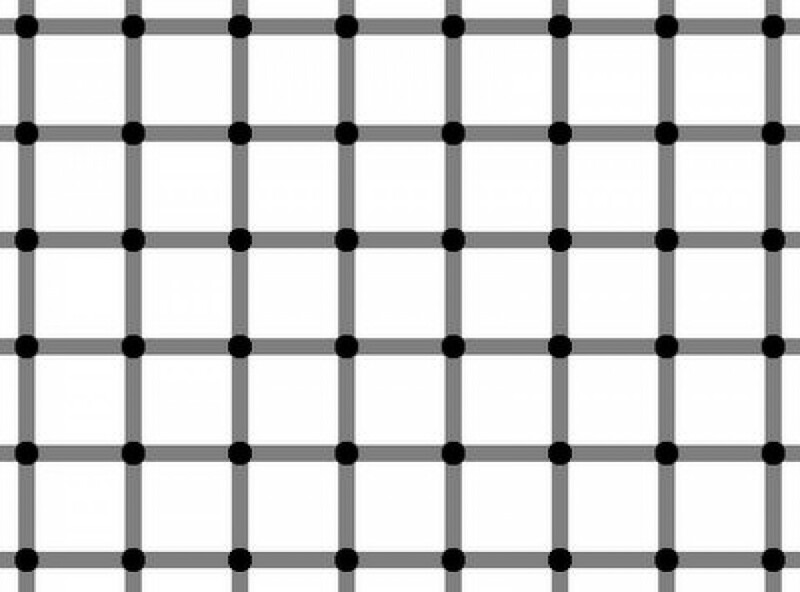 Whether or not consciously deployed, these illusory sequences of dancing grey dots add further conceptual weight. 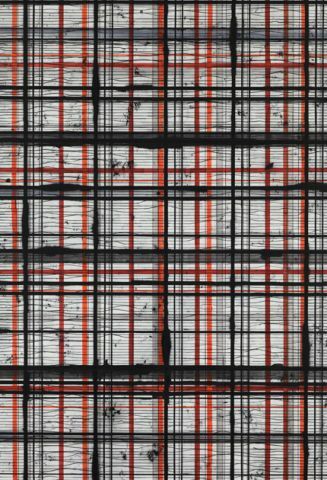 If Francis explores the inherent invisibility of everyday networks, these ephemeral images tally nicely with the work’s intellectual framework: to depict that which is ultimately unrepresentable. [ii] This technique was famously used in OpArt canvases, by artists such as Bridget Riley.